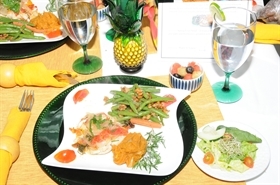 THE GET WELL BAHAMAS CHALLENGES COMPETED IN THE COOK-OFF CHALLENGE. THERE WERE FIVE TEAMS WITH EIGHT PERSONS EACH. ALL OF THEM ADDING A UNIQUE FLAVOUR TO EACH GROUP. THE CHALLENGERS APPLIED WHAT THEY WOULD HAVE LEARNED IN REGARDS TO NUTRITION AND HEALTHY EATING.